To take your bike through a door, stand between the door and the bike. When it comes to stability over tough spots, a mountain bike beats a road bike every time. Stability is certainly needed with all the roadwork and construction now going on in Salt Lake City and nearby urban areas. But aside from safety, city mountain biking is fun. Greenberg is an expert on doing the city by mountain bike. Something as simple as opening a door to get in or out of a building with your bike can be a bang-and-bash affair if you don’t know how to manage it gracefully. Greenberg says, “Stand between your bike and the door. Hold the bike stem (the part that holds the handlebars) with the closest hand. Steady the bike. Open the door with the other hand, walk in while holding the door open, and you’ll make a smooth entrance or exit.” Greenberg's technique is pictured above. On winding dirt trails, you’re already prepared for the unexpected. But city riding can lull you into not paying attention until it’s too late. I was once riding fast on a dimly lit street in the evening when I rode up on an unexpected tangle of chain-link fence. Without thinking, I just powered on the pedals and rode over it—thus saving my skin. Greenberg says that’s sometimes the best way to handle a sudden obstacle like a pile of wooden boards or trash: Just power through. 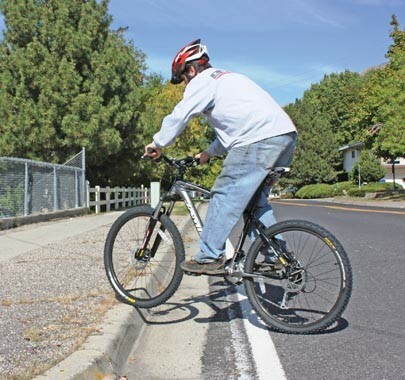 Curbs are often intimidating to riders who aren’t used to riding over them. Greenberg advises, “Approach the curb as close to a 90 degree angle as you can—head on. Push down on the handlebars to compress the fork, which adds a little spring when you bring the fork up by quickly pulling back on the handlebars to lift the front wheel over the curb. Then shift your weight forward (unweighing your feet) so you’re leaning on your handlebars. The rear wheel will simply ride up over the curb.” Practice on small curbs until you get the timing perfected, as seen below. Greenberg also has a great way to cross a busy street without having to get off and walk your bike. It’s the “scooter” technique. “I stand on the pedal on the side of the bike without the gears, bring my other leg around to the same side and let it hang in back of the pedal, almost like a scooter. 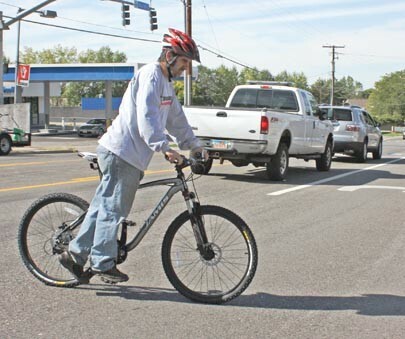 Keep hands on or near the brake in their normal position and glide across the street,” he says. The technique allows for foot agility in case you have to dodge unexpected traffic, as seen below. Moving traffic isn’t the only motor risk. Even stopped vehicles can be dangerous. Keep a peripheral visual on parked cars. If there’s someone in the driver’s seat, slow down and be prepared for a door to open right in your path, or for the car to pull out in front of you. And if a ball rolls out into the street, be prepared for a child to run out without looking to chase after it. Now for the big problem of city riding: theft. Don’t just randomly lock your bike. I once saw a mother and her two pre-teens crying over their stolen bikes, which they had locked to a pole with nothing on top of it. Surveillance video showed that the thief just lifted the bikes up off the pole, put them in his truck bed and drove away. Buy good locks, not cheap ones. If your bike has a quick-release front tire, take it off, place it against the rear tire, then lock both tires and the frame to the bike rack or a secure pole so the front tire can’t be stolen. Put the lock up as high as possible so a thief can’t bash the lock against the cement to break it. The best anti-theft measure? Take your bike with you whenever possible. 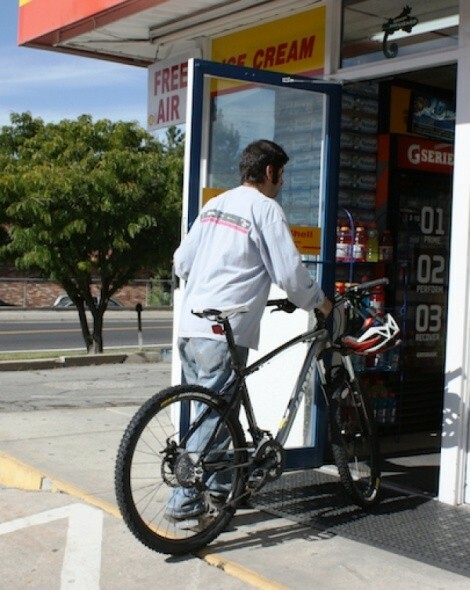 In grocery stores, hang a basket from a handlebar; at checkout, put your purchases in a backpack. In banks, stand in line with your bike. In today’s world, wheeling a bike with a helmet hanging from the handlebars actually makes you look cool.